Garbutt Construction Company worked alongside Houser Walker Architects LLC to rehabilitate the Newnan Municipal Building. Originally constructed in 1939, the newly-restored building is comprised of three distinct spaces within one building, providing Newnan with a versatile facility to serve as an auditorium, fire station, and office space. The building is equipped with all new electrical, HVAC, and plumbing systems, restrooms in the auditorium, and a modern fire slide. 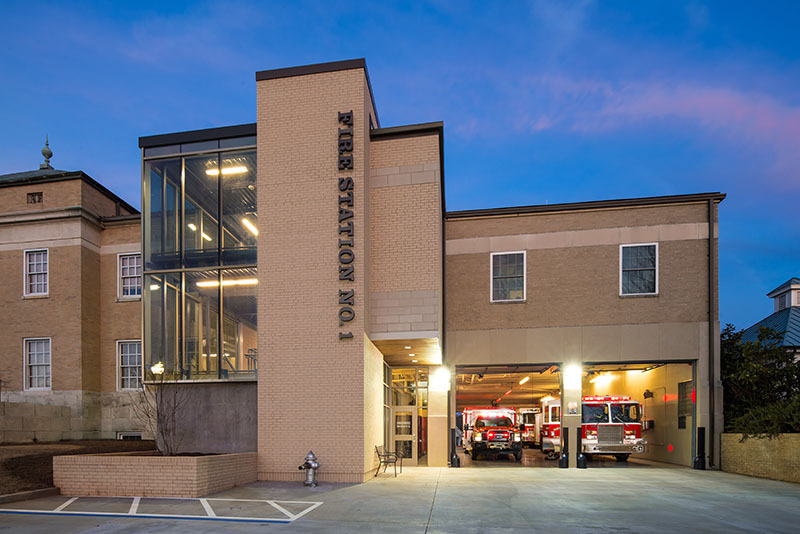 Living quarters, a gym, and ample storage were added to the fire station, making this municipal project unique. The original building included two distinct structures, separated by a small alley between them. A two-story glass enclosure was added to unite the structures. The façade of the building features a combination of classical and Art Deco architectural elements that make a bold statement in this small, southern town. This landmark of Newnan brings pride to the city, and because of the rehabilitation; the Municipal Building may continue to serve the needs of Newnan’s citizens for years to come.